The construction works for the Sanmen NPP Phase 1 project started in 2008. Image courtesy of China Institute of Water Resources and Hydropower Research. The reactor vessel for the first unit of Sanmen NPP (Sanmen 1) was manufactured by Doosan at its Changwon Plant in Korea. The Sanmen 1 reactor vessel arrived at the site in July 2011. Harbin is providing steam generators and other auxiliary components for the AP1000 Sanmen 1 and 2 plants under license from Mitsubishi Heavy Industries (MHI). The Sanmen Nuclear Power Plant (NPP), currently under construction, is located in the Maotoushan peninsula in Jiantiao, of Sanmen County in the Zhejiang Province of China. It is being developed by Sanmen Nuclear Power Company (SNPC), a consortium of China National Nuclear Corporation (CNNC) (51%), Zhejiang Energy Company (20%), China Electricity Investment Nuclear Power Company (14%), China Huadian Company (10%), and China Nuclear Engineering and Construction (5%). The plant is planned to be developed in three phases, consisting of the construction of two nuclear reactor units each. The $5.88bn phase one includes the construction of Sanmen 1 and Sanmen 2 in Zhejiang Province. The second phase consists of two units in Haiyang, Shandong Province, while the third will comprises two units at the Alvin W. Vogtle electric generating facility near Waynesboro, Georgia. The project proposal for the Sanmen NPP was approved in September 2004. It was decided to obtain third-generation pressurised water reactor nuclear power technology for the proposed NPP through an international tender. The bidding started in 2004. An MoU was signed between China and the US for cooperation in the field of third-generation nuclear power technologies in December 2006. In a joint venture with Shaw, US-based Westinghouse was selected as the preferred bidder to provide the nuclear reactors for the Sanmen NPP. An agreement was signed between the general contractor State Nuclear Power Technology Corporation (SNPTC) and Westinghouse (along with its consortium partner Shaw) in July 2007, according to which the latter would provide four third-generation pressurised water reactors, including two for the Sanmen NPP phase one. Sanmen is the first project to be developed as part of the Sino-US high technology co-operation for introducing and transferring the third generation nuclear power technologies into China. When fully operational, Sanmen NPP will consist of six advanced pressurised water nuclear reactors. Site construction works for the Sanmen NPP phase one started in February 2008. The excavation of the pit (diameter 40m and depth 12m) for the Sanmen reactor one was completed in September 2008. The base mat structural concrete for Sanmen 1 was completed in April 2009. It involved 5,200m3 of concrete, 950t of reinforcing and 1,000 anchor bolts. The Containment Vessel Bottom Head (CVBH) for Sanmen 1 was placed using a crane in January 2010. The CVBH is a steel structure with a capsule-like shape and weighs around 700t. In July 2011, the reactor vessel for Sanmen 1 arrived at the site. The vessel weighs 340t with a diameter of 4.5m and length of 12.2m. It was manufactured by Doosan at its Changwon Plant in Korea. The reactor pressure vessel for Sanmen 1 was installed in September 2011. Westinghouse completed the fabrication of 157 fuel assemblies for Sanmen 1 at its Columbia fuel fabrication facility in March 2012. The fuel assemblies were shipped to China subsequently. The top head of the Sanmen 1 containment vessel was successfully placed with the use of 38m long polar crane in January 2013. Shandong Nuclear Power Equipment Manufacturing Company of China manufactured the 659t containment vessel top head. Sanmen 1 was connected to the nearby 220kV substation in March 2012 for the offsite power needed for the testing of electrical systems. The full scope plant reference simulator for Sanmen 1 was also installed in January 2013. Excavation works for Sanmen 2 were carried out simultaneously. The foundational concrete structure for the second reactor was also complete in December 2009. In April 2018, CNNC received the ratification from the Ministry of Ecology and Environment and National Nuclear Safety Administration for the fuel loading in the Sanmen 1 reactor unit. Construction on the Sanmen 1 began in April 2009 and the unit was connected to the national grid in June 2018. The construction works for Sanmen 2 began in December 2009, with commissioning scheduled for the end of 2018. APR1000 is a two-loop pressurised water reactor with a gross power rating of 3,415MW and a nominal net output of 1,117MW. The reactor features modular design and a passive safety system, and delivers greater efficiency and easier operation. It is the first third generation nuclear power technology to receive approval from the US Nuclear Regulatory Commission (NRC). The NRC also certified the amended design of AP1000 reactor to enhance safety and bring down the construction cost further, in December 2011. The Nuclear Steam Supply System (NSSS) of the AP1000 is operated by two Delta−125 steam generators. Each steam generator is connected to the reactor pressure vessel by a single hot leg and two cold legs. The emergency cooling system is designed to function without electricity for up to three days. The safety system of AP1000 is based on physical processes, such as gravity, natural circulation and compressed gas, instead of a series of safety support systems, including pumps, fans, diesels and chillers, as used in a typical NPP. The passive safety system allows the reactor to safely shut down on its own in the case of any accidents. Shaw is responsible for the engineering, procurement, commissioning, information management and project management of phase one of the Sanmen NPP. Curtiss-Wright provided the reactor coolant pumps (RCP) for the first AP1000 nuclear plant. IWHR Technology of China was engaged for the site construction for Sanmen units 1 and 2. TISCO provided extrusion stainless steel C profile for the nuclear plant. NuCrane supplied the polar crane for the construction. Other equipments for the project are being provided by the Shandong Nuclear Power Equipment Manufacturing (SNPEMC), which was set up in 2007 by SNPTC. 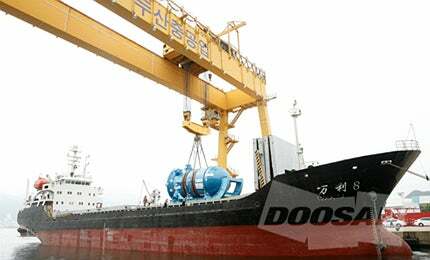 Doosan provided the nuclear reactor vessel for Sanmen 1. Deyang Heavy Equipment received the pipe contract for Sanmen 1 and 2. Harbin is providing the steam turbines and generators for Sanmen 1 and 2 under license from Mitsubishi Heavy Industries (MHI). SEL supplies the protective relays and communications devices for the Sanmen NPP phase one. ABB is providing all the low and medium voltage switchgears for the project. Schneider Electric is providing the medium voltage inverter products for the NPP. Emerson is providing the control valves for Sanmen 1. It was also awarded the contract to supply its Ovation expert control technology for the first two reactors of Sanmen. Weir is providing the triple offset butterfly valves for Sanmen unit two. In collaboration with Westinghouse, Bureau Veritas is providing the inspection and quality assurance service for the project. In 2016, AZZ was awarded a contract worth $11m for providing the gas insulated line for the Sanmen 2 unit. China has the target for generating four percent of its electricity from nuclear power by 2020. It is striving to achieve self-sufficiency in terms of third generation WPR nuclear technology, such as the AP1000, in this regard. The country is also aiming for business opportunities in the international power market besides domestic utilisation of this technology. China has recently developed the design of CAP1400, which is based on Westinghouse’s AP1000 reactor technology. The intellectual property rights (IPR) for the CAP1400 are owned by the country. CAP1400 technology is currently under evaluation. Export potential of the technology will be explored as soon as a demonstration project of CAP1400 is completed. Westinghouse Electric, a unit of Toshiba Corporation, is building four AP1000 nuclear plants in China, representing the country’s first construction of advanced US nuclear plants. The largest nuclear reactors ever built in China – Tianwan-1 and 2 – are now complete.